At least once a year, you probably ask your members, patients or wellness program participants to complete a health assessment questionnaire. It’s a valuable way to help individuals identify their own health risks and encourage healthy lifestyle habits. The health assessment questionnaire also provides you with useful data about the health of your population. But in today’s environment of cyber hacking, identify theft, and online privacy issues, you might find some people reluctant to complete a health assessment questionnaire. What do you do then? You can’t force an employee to complete a health assessment questionnaire, but you can address any concerns they may have. Taking the time to address concerns before your open period for completing the health risk questionnaire can increase engagement and participation and give you valuable population health data to make decisions about wellness programming, initiatives, and interventions. It’s important to protect personal health information. Your members, patients, or participants need to know you’re going to handle their information with great care. We recommend that any personal health information is always sent via secure email or a secure FTP site. If someone asks about how their information will be stored and used, be prepared to answer. Responses to the health risk questionnaire are confidential and private. But we do look at aggregate or group data to identify population health risk factors and make decisions about wellness programming. This is probably one of the biggest sticking points when it comes to concerns about health risk questionnaire data. Make it clear to your participants who will have access to their data and for what purpose. (e.g. the wellness program administrator, health coach, or medical personnel for follow-up). In many cases, organizations choose to have management only view aggregate data of the group (no personally identifiable information), and only a third-party has access to individual participant data for things like health coaching or medical care. Here’s another way to handle concerns about the health risk questionnaire. Describe the questions participants will be asked to answer. Let them know what to expect. For example, our WellSuite® IV Health Risk Assessments include 42 questions about biometric data, nutrition, physical activity, social and mental health, and readiness to change. Let your participants know you follow all state and federal privacy laws, including the Genetic Information Nondiscrimination Act and the Health Insurance Portability and Accountability Act. Establish security measures to protect personal health information. Grant access to personal health information only to a designated person like the wellness program administrator, or use a third-party. Assure participants their data will not be used for any unlawful or discriminatory purposes (e.g. insurance rate premium increases based on responses to the health risk questionnaire). If a third party has access to personal health information, describe the security measures in place to protect the information and maintain confidentiality. Get a signed copy of the consent and release form from each participant before beginning the health risk questionnaire or other assessments. Taking the time to address concerns about the health risk questionnaire can help increase participant engagement which provides you with a more complete picture of your population’s health. To disseminate this information to your participants, send an email, host a webinar or meeting, mail a letter, provide a person to contact. Make every effort to address concerns about the health risk assessment questionnaire, and it will make a difference. 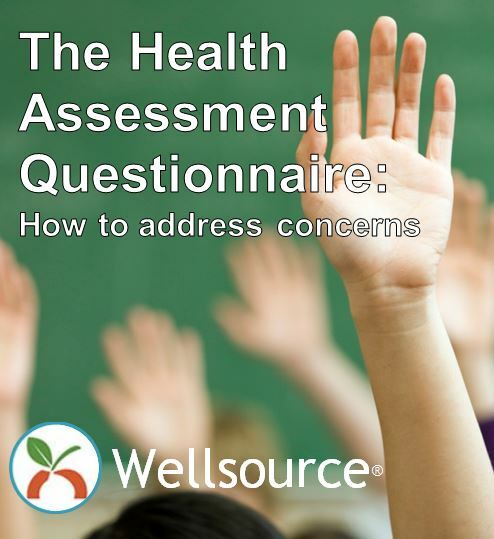 How do you address concerns about the health risk assessment questionnaire? Let us know in the comments below. For more information about health risk assessments, click here.